This next stage of the works required was another very complicated build due to the complex nature of the angles in the room. I had to template the whole of the area and then re-construct the room in my workshop before I could start the process of fabricating the carcasses. 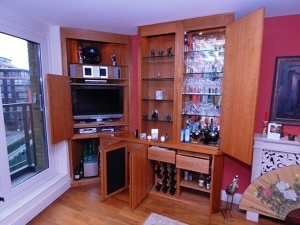 The first part of this large project was the design, fabrication and installation of a unit that was the combination of a drinks/display cabinet + the housing of my clients A/V system. 2003 will definitely be remembered as the year of the box! 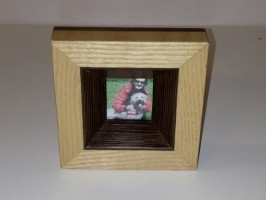 I had another commission to design and build a particularly detailed trinket box for my client in Hayes. 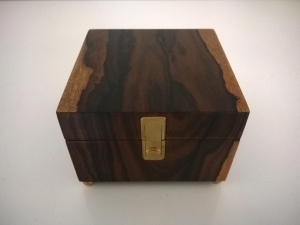 The contrast between the Maple marquetry and the solid mahogany looked stunning! 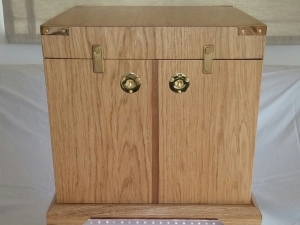 Another commission to make a decorative box this time to house my clientâ€™s very expensive jewellery collection. It also included a 5 lever lock for security and was French polished the traditional way with a rubber. It took two days to build the right body of polish my client was very pleased with the end result! 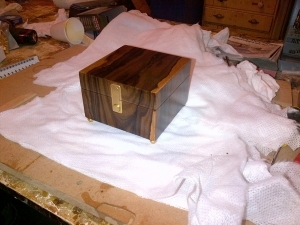 Another great commission to make a humidor for my clientâ€™s cigars. 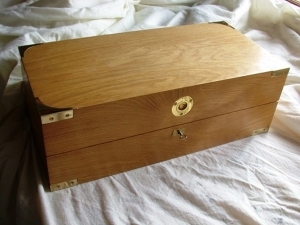 This time the carcase featured mitred corners so as to hide the end grain and inlaid brass corner straps to protect the corners from knocks. 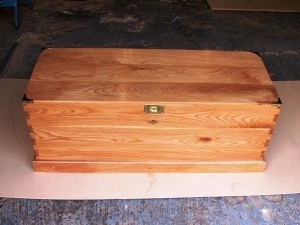 A very ornate project for my client in Islington, she gave me free reign to design this storage casket for her hallway. 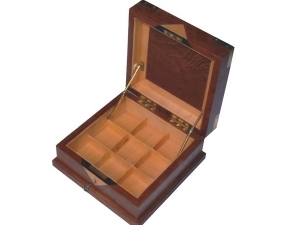 The carcass featured hand cut dovetails and I hand polished the whole unit inside and out with shellac and Briwax. A really interesting build to create a desk for an architect at the Barbican. 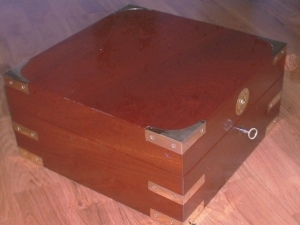 The customer wanted the desk to appear as if it was floating which created some unique design challenges also due to access constraints the desk had to be made in two halves. 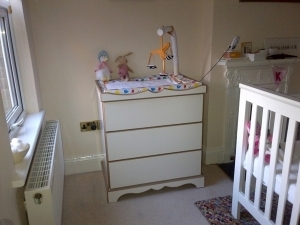 The spraying was completed by Michenuals of London. A very complicated build which was very challenging to complete due to the opening being very out of square. 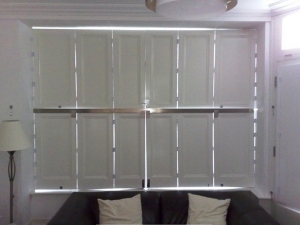 A very satisfying build to complete and the client was very happy with the finished result as it acted as a deterrent plus with the shutters able to open independently top to bottom this allowed the lower half to be closed but still allowing light into the clients living room. Ramp for off-loading a quarter scale Rolls-Royce jet engine, Lower Oxford Street W1. 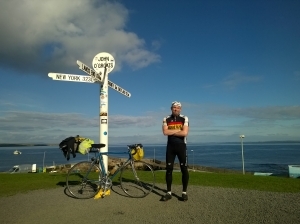 What an unusual project! 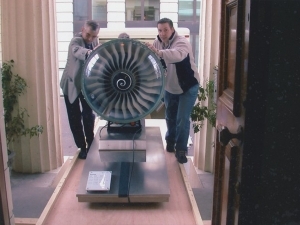 This involved me fabricating a ramp to facilitate easy entry of a quarter scale jet engine, the frontage of the property had a large staircase leading to the double doors so the ramp had to be made so as to compensate for the different levels. 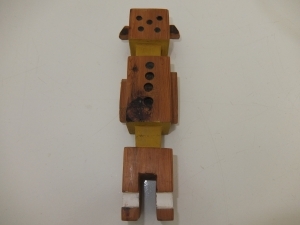 It also had to be dismountable so as to be used again. 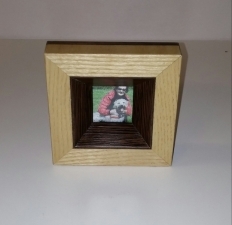 A nice opportunity to flex my joinery skills with this project. 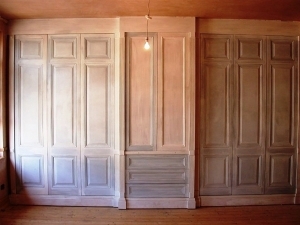 The doors featured raised and filled panels, polished on the inside and painted on the fronts. All the locks were supplied by Banham and fitted by myself the collective weight of each door was immense! 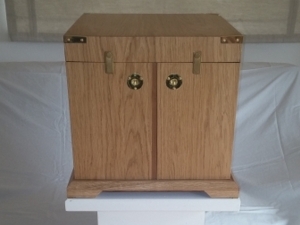 This project involved me making a fairly straight forward run of maple storage units all hand polished by myself. 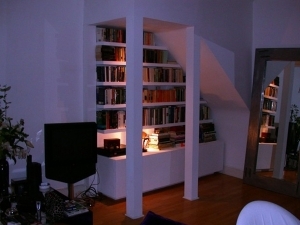 These bookcases were fabricated for a famous rockstar in Pentonville. The carcases were manufactured from paint grade materials with all the shelves suspended on ï¿½tonk stripsï¿½ allowing for easy adjustment. 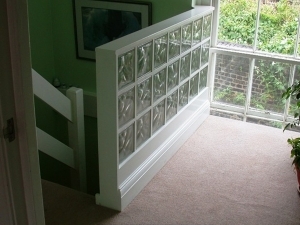 The finishing touch was fixing aluminium kickers to the skirting to match the existing detailing in the room. This project required the carcases to be fabricated from 19mm MDF with the frontage made from solid ash. 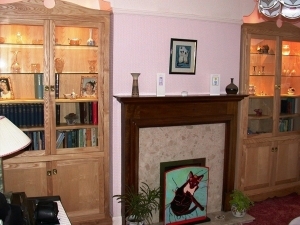 The upper carcases were lit with downlighters to display ornaments/books etc. The units were then hand polished and waxed. 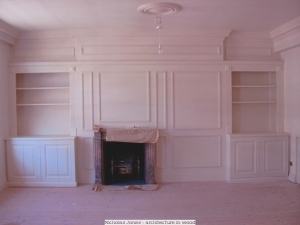 The start of this project was to make the bespoke wardrobes in a particularly large flat in Marble Arch W1. 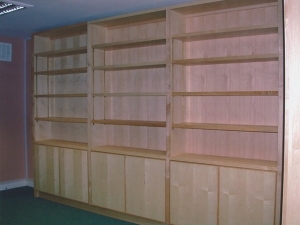 The wardrobe carcases were fabricated from 19mm mahogany veneered MDF with the solid fronts to be painted white. The dovetailed drawers were a highlight along with the raised and filled panelled doors. A rare opportunity to work in a Grade A listed 5 storey property in Kensington SW7. My client's were renting and required highly decorated alcove storage units that were free standing in design to facilitate easy removal upon there return to America. The units where spray painted white by Michenuals French Polishers. 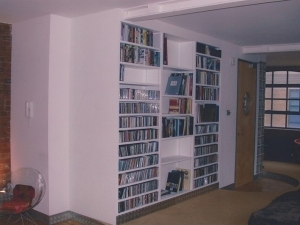 Bespoke cherry shelving units installed in a small property in Soho. 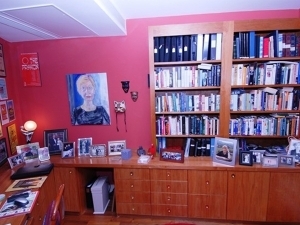 The project had an unusual detail in that you walked through the bookcase to gain access to the writing desk in the next room. Again hand finished in shellac sanding sealer and 2 coats of Briwax. 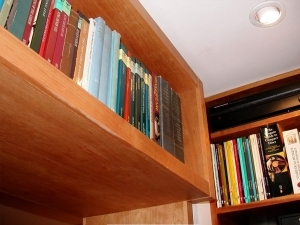 ï¿½Floating Shelvingï¿½ project which required secret chemical rod fixings to support 45mm thick shelves to give the impression of them floating. 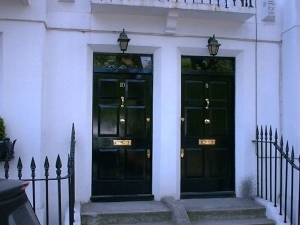 The 45mm thick doors where supported on ï¿½sossï¿½ hinges replicating styling cues from other detailing within the clients property. 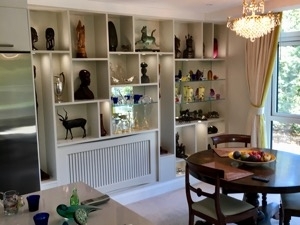 An interesting project which required me to remove a stud partitioned wall and replace it with a new wall fabricated from clear acrylic blocks to introduce ï¿½borrowed lightï¿½ to the lower hallway in the clients property. 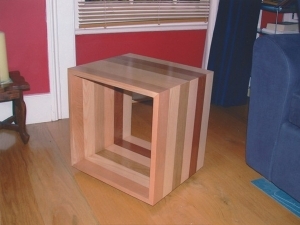 A small commission to build a very unusual multi-grained occasional table again hand polished with Briwax. 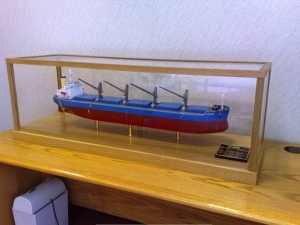 Fabrication of a model tanker display cabinet for a London based shipping companies head office conference room.